All right. Let’s clear the air—Georgette Heyer was no Jane Austen, who while writing about love and the upper class, delved into the condition of women and the cruelties of the British aristocracy. Heyer, while not ignoring the excesses of the upper class, blithely skimmed across them. Simply put, Austen is deeper than Heyer. Also, Heyer’s writing style is not as fine as Jane Austen’s. There, we’ve gotten that out of the way. But what fun Georgette Heyer’s novels can be, and sometimes, fun is exactly what a person needs. 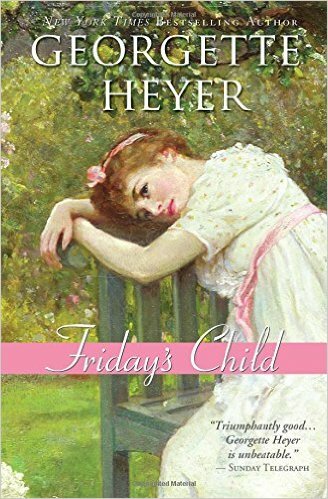 Recently I came across Heyer’s Friday’s Child in my bookcase, and I decided it was exactly the right book to distract me from the political season. And so it was. Friday’s Child is equal parts romance novel, farce, and screw-ball comedy, and Heyer whips the reader through the first months of the improbable marriage of the very young Hero Wantage and the self-centered Lord Sheringham (aka Sherry). Hero and Sherry have known each other from childhood, and when Sherry comes upon Hero, a poorly-treated orphan who is down in the dumps because her guardian and cousin is insisting that Hero go to Bath to become a governess, well, Sherry does what any high-minded young male of the Regency era might do—he proposes marriage. (An added inducement is that Sherry won’t come into his large inheritance until he marries.) Hero, who has been in love with Sherry since she was very young, immediately accepts the proposal. In today’s parlance, it is a win-win situation. Off to London the pair go, where Hero gets into one “scrape” after another. Hero, who falls into the category of the adorable but naive heroine, must be schooled by Sherry and his friends, well-meaning but imperfect and hilarious teachers. Most of Hero’s mistakes involve making the wrong sorts of friends and going to the wrong sorts of places, thus opening her up to public shame and snubbing. However, on a more serious note, both Hero and Sherry run up huge debts while gambling. Unlike most romance novels, the central concern of the story isn’t whether the two protagonists will end up together—indeed they are married early in the story. Instead, the plot revolves around Sherry, who must learn not to be so selfish and to fall in love with his sweet but hapless wife. I must admit that as I chortled my way through Friday’s Child, I wasn’t particularly worried about this. With all such novels, the destination is never in doubt. Instead, it is the delightful journey that matters. I’ve never read any Georgette Heyer, but appreciate your sentiment in wanting a little escapist reading lately. I’ve been immersed in “Epitaph” lately (by Doria Maria Russell), a totally engrossing novel about Tombstone and the events and leading to and the personalities involved in the OK Corral shootout. It’s a follow-up to “Doc,” which was just as entertaining. There’s nothing like a good old-fashioned book that you can lose yourself in. I have put it on my list!!! With summer on the way, this book sounds like it might be just the right kind of holiday reading! If you read it, hope you enjoy it as much as I did. Sounds like a fun read. Might be good as an audio book on one of my drives to Springfield.